When the temperature drops below 80 degrees in Florida this time of year, it’s considered a cold front. Fortunately for us students at The University of Florida, we recently experienced one of these cold fronts. 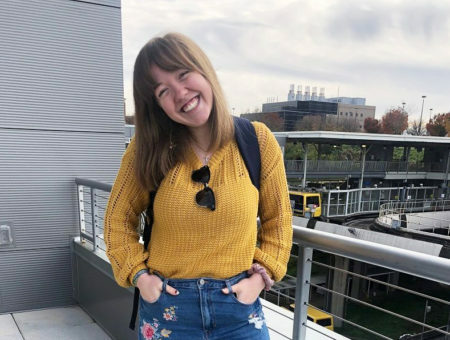 For a short while, fall trends were abundant on campus, but as soon as the temperatures rose back to their usual level, the sweaters, leggings, and scarves disappeared as well. I was on the hunt to find someone who nailed the fall-to-winter transition look and handled the unstable conditions with ease. 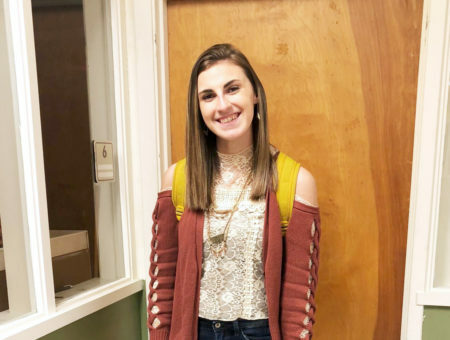 Cheyenne’s outfit caught my eye, so I stopped to chat with her about the style changes she’d seen across campus over the past week. I introduced myself and she proceeded to tell me she owned the same dress I was wearing. It was fate. Do you have any favorite designers? 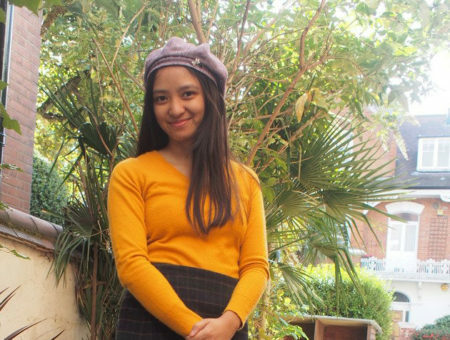 “I’m not that knowledgeable about designers and brands. I just buy what I like from stores like Forever 21. I love Cheyenne’s statement necklace from Forever 21. 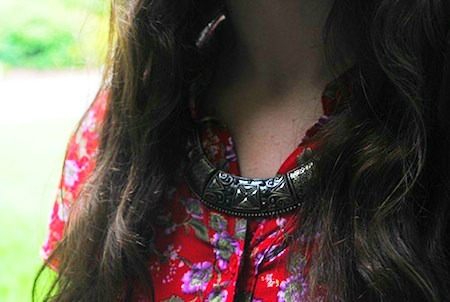 This vintage-look patterned necklace contrasts with the floral print of her dress flawlessly. Wearing a necklace underneath a collar, like Cheyenne did here, can give any look a fashion-forward vibe. 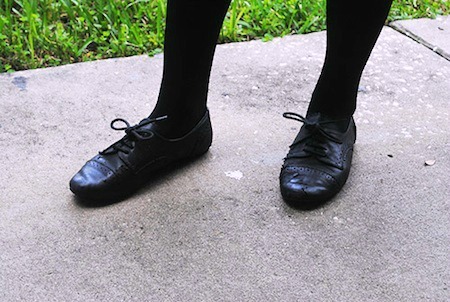 Oxford flats are smart and sassy, especially when paired with tights. 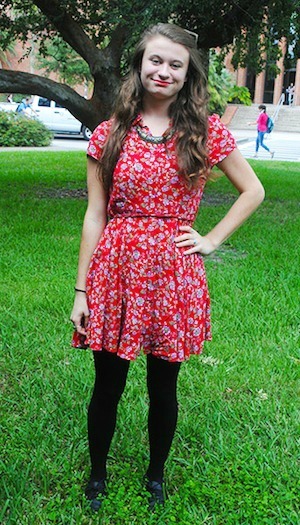 Cheyenne rocked her oxfords with opaque black tights to give this transitional outfit an autumn-inspired touch. Mixing several different styles of rings can look a little mismatched, but Cheyenne’s small rings all look fantastic together. Mixing her jewelry like this makes her outfit more bohemian. 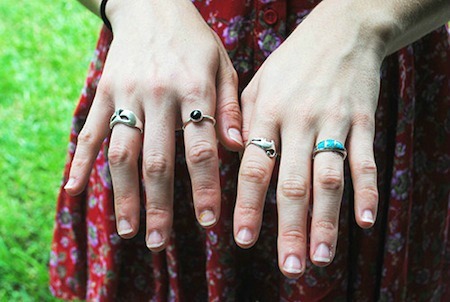 We give her a thumbs up for rocking all these funky rings! What do you think of Cheyenne’s look? Do you love dresses and tights for fall? Do you have any flat oxfords, and if yes, how do you wear them? What’s your favorite way to transition your outfits for fall? Leave a comment below and let us know!